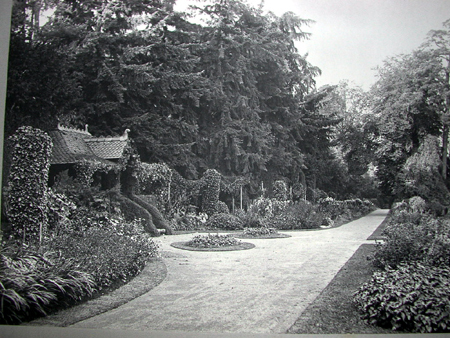 Privately owned and open occassionally under the National Garden Scheme. 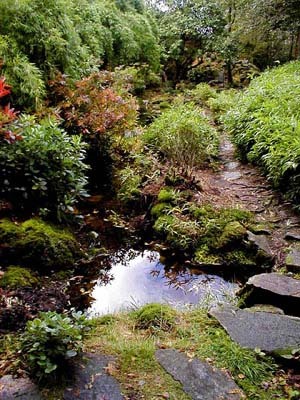 A Japanese style bridge and beautiful water gardens are the high spots of this delightful garden in the limestone belt between Milnthorp and Arnside, south of Kendal. In 1799 William Wordsworth first rented the old inn that was called the Dove and Olive Bough, which became famous as his creative home Dove Cottage. Although now overly popular on the tourist trail the cottage draped in masses of the rose Prelude and honeysuckle is well worthy of a visit on a quiet morning or late afternoon. Wordsworth had less time for what he called 'exotics' of the garden. Hence the garden features such native dlights as Cowslips, primroses, sweet peas, foxgloves, yew trees planted by the poet and needless to say, daffodils! Dunningwell Hall in Millom. The gardens are open for viewing and include 3 Victorian Ponds, statues and water features, woodland walks and much more. Nestled in a small wood called Giggle Alley, in Eskdale, a Japanese Garden (Seen right) had lain largely neglected since its sale in 1949. But over the past few years the Forestry Commission has teamed up with local volunteers to rescue it. Privately owned but open to visitors under the National Garden Scheme. Located just north of Chapel Stile village on the Amblesdie to Langdale road. Acers and rhododendrons envelope paths through mature woodland with dramatic backdrops of the Lakeland fells. If you can find a quiet time in the spring or autumn this is a cosy cottage garden. Beatrix Potter wrote many of her famous children's stories in this little 17th-century house and it has been kept exactly as she left it, complete with her furniture and china. There is a traditional cottage garden attached. A selection of her original illustrations may be seen at the Beatrix Potter Gallery. 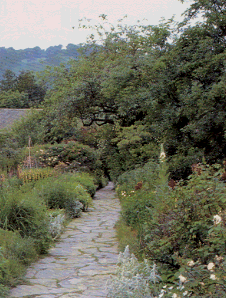 See the garden Beatrix Potter used as her inspiration at Keswick. Bus: Stagecoach in Cumbria 505/6 Ambleside--Coniston service (connections from BR Windermere); also frequent service from BR Windermere to Bowness Pier, thence ferry and 2ml walk (tel. 0870 608 2 608) Also this year "Mountain Goat" (buses) are running a shuttle service from Ferry House to Hawkshead via Hill Top to link with "Windermere Lake Cruises" Launch service from Bowness. Station: Windermere 4½ml via vehicle ferry. Woodland and lakeside walks on the road north from Keswick towards Carlisle. Shrubs and open parkland are the main features of the ground underneath the Bassenthwaite lake flanks of Skiddaw. This architecturally austere northern stone manor house was well known to Tennyson, Wordsowrth and Thomas Carlyle. Mirehouse has an adventure playground for children and a walled bee garden. Tel. 017687 72287. Noted for its Azaleas and woodland walks, plus a breathtaking terrace with views up the Eskdale valley to Scafell. Gardens and owl centre open daily all the year round. Tel. 01229 717614. Nationally renown nurseryman Thomas Mawson was the driving force behind this large formal garden completed in 1909. In turn the house has been a stately manor, hotel, school before its present role as retreat house and conference centre for the Dioces of Carlisle. Its formal gardens and fountain contrast perfectly with the silvan landscape of the surrounding fells. The gardens are open most days from 9am to dusk and are free with a small donation expected. Opening hours:March - October 09.30-17.00 November - February 10.00-16.00 Closed Tuesdays in winter William Wordsworth's home from 1813 until his death in 1850. Family portraits, personal possessions. Extensive garden landscaped by the poet, with terraces, rare shrubs and magnificent views. Car park. Gift shop. Evening poetry readings for groups by arrangement. Reciprocal discount with Dove Cottage and Wordsworth House. Home to the Browne family of yeoman farmers from 1626 to 1943. This perfect lakeland cottage and its simple garden are now in the custodianship of the National Trust. Captures the true Cumbrian rustic architecture and is less of a tourist honey-pot than Dove Cottage and Hilltop, Sawrey. On the quiet (western) side of Lake Windermere, the gardens took Thomas Mawson from Troutbeck four years to create. He used rhododendrons, azaleas and flowering shrubs to cope with the thin acid soils around the Victorian Gothic hall. The gardens are open to the public throughout the summer. In private ownership. Perhaps more famous than the Hall itself was its owner, the late Mary Burkett. She ran the Abbot Hall gallery in Kendal for many years until someone "she met at a strawberry tea " left her Isel Hall in her will. Mary Burkett also included an 18,000 journey across the Middle East in a Land Rover as just one small part of her amazing c.v. But to focus on the gardens of Isel. 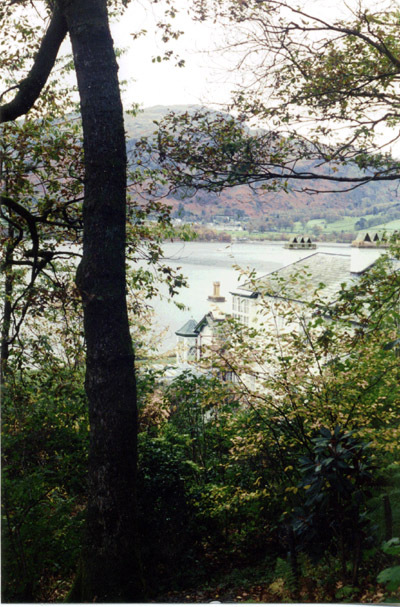 The hall is a stone gem overlooking a deep bend in the River Derwent some four miles upstream from Cockermouth Castle. A meadowland with red poppies and marguerites has been deliberately encouraged on the lower terraces. Privately owned, the public are allowed rare open days (Check with local Tourist Information Offices). Elizabethan house, home of the Bagot family, containing a collection of Jacobean furniture, fine paintings, the earliest English patchwork and many other beautiful objects. The most famous topiary gardens in Britain are at Levens Hall in the Lake District. In 1694 Guillaume Beaumont, who also worked at Hampton Court Palace, first laid out the topiary and gave the garden its quartered layout, which includes the earliest ha-ha in England. The gardens have changed remarkably little since. The National Trust is restoring these wooded Victorian gardens at the southern end of Lake Windermere. A good robust lakeside play and picnic area that will suite families with young children. Just off the A592 between Bowness and Newby Bridge. A beautiful private garden overlooking Cockermouth that allows visits by prior arrangement.